News Report (translated from MIGnews.com): Millions of people all over the world are immersing into Second Life – the new virtual madness that encompasses all areas of human life. In the past week alone, 1.4 million new members have become immersed in this obsession. There they construct themselves and seek adventures in the new, exotic reality. My Comment: Actually, we’ve been doing this throughout all of human history. It just wasn’t as obvious as it is now, through a screen. Our culture is but a distraction from the purpose of creation, as is all the “exciting” entertainment we fill our lives with. They all have the same root – to run away from the question about the meaning of life. The problem is that the old methods of “killing time” don’t attract us anymore. They’re too weak. In the virtual word, however, we can let our imagination soar, plus we get this illusion that anything we desire is within a moment’s reach. However, soon enough our egoism will outgrow this as well, and we will have to seek the true fulfillment – the Light, the Creator. That’s because He created us, and our egoistic development will bring us to Him. This is why the Torah refers to our egoism (when speaking about the created woman): “Ezer Ke Negdo” – your helper, who is against you. Laitman.com Post: It’s Time to Implement Baal HaSulam’s Dream – In Virtual Space! Kabbalah Today Article: Better Than the Virtual World!? Kabbalah Today Article: What Is “Second Life”? Our center was visited by a film crew from Channel 2, Israel’s most popular television channel, which attracts millions of viewers each week. The film crew was headed by Roni Kuban – journalist, director, and script writer. The crew spent five days working at our center. Their objective was to understand what is happening here. They came to us with this proposition, and we agreed because we are open to everyone. Of course, there’s a chance that they won’t understand anything and will write and show us “as usual.” It is impossible for us to influence the content of their program. However, we could not turn down the opportunity to tell people about Kabbalah on the most popular program of the most popular TV channel. Next Tuesday we will see what they “cooked up.” They’re nice guys, but the nature of their job requires them to get “the juicy scoop,” to deliver something scandalous. Besides, it’s not always easy to understand what Kabbalah has to say. 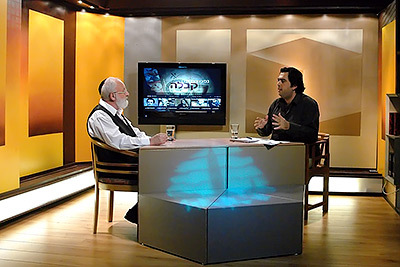 Personally, I place my hopes on the viewers to be able to read between the lines, and because they feel the crisis that is happening, they will understand that Kabbalah offers the solution. This is being done for them! News Report (from Time Magazine): Harvard social scientist Dr. Nicholas Christakis and his political-science colleague James Fowler at the University of California at San Diego created a sensation with their announcement earlier this month of a 20-year study showing that emotions can pass among a network of people up to three degrees of separation away, so your joy may, to a larger extent than you realize, be determined by how cheerful your friends’ friends’ friends are, even if some of the people in this chain are total strangers to you. In their most recent paper, published in the British Medical Journal, Christakis and Fowler explored the emotional state of nearly 5,000 people and the more than 50,000 social ties they shared. That led to their intriguing finding of just how contagious happiness can be: if a subject’s friend was happy, that subject was 15% more likely to be happy too; if that friend’s friend was happy, the original subject was 10% more likely to be so. Even if the subject’s friend’s friend’s friend–entirely unknown to the subject–was happy, the subject still got a 5.6% boost. The happiness chain also worked in the other direction, radiating from the subject out to her friends. My Comment: And if we would mutually “infect” (energize) each other with happiness, everyone would be 100% happy. You may object, “But I don’t feel any happiness!” This is no excuse because even if you smile artificially, another person will perceive it as real, and will become happier, more joyful – and it will come back to you through someone else. This is how beginner Kabbalists, who haven’t yet attained the greatness of the Creator, infect each other with the feeling of His greatness in order to artificially rise above egoism. While they still don’t have the quality of love for each other, they artificially cultivate love, they “play love,” and then it really emerges because their desire evokes the Light of Correction (Ohr Makif) from above. Something similar happens in our world: a child who wants to be a grown-up, grows by imitating the grown-up. Unknowingly, the child attracts a higher energy upon himself. It is called “higher” because it comes from the child’s next degree of development, and it comes to the child because of his desire to reach it. This is the only method to ascend from one degree to the next, both in our world and in the spiritual world. Even when we observe the dynamics of growth in vegetative and animate organisms, we witness the same principle: the negation of one’s current state and the desire for the next state become the driving force of change and growth. Hence, Kabbalah uses real forces of nature! News Report (from Reuters): The online survey of 28,153 people in more than 51 countries by the global marketing and information firm Nielsen, found that as the world grapples with a recession and financial markets remain volatile, many people are reminding themselves that money can’t buy happiness. As well as gauging levels of happiness, the Nielsen survey examined what specific factors contributed to happiness around the world. “Many of the world’s poorer and emerging markets outranked developed countries for happiness and satisfaction levels in nearly all aspects of their lives,” said Paul. Why Are People Turning More Pessimistic? News Report (from the All-Russia Public Opinion Research Center): Public opinion experts report that Russians have lost their optimism about the future. The turning point in their mood occurred in August-September. Before then, the optimistic contingent was on a steady increase, while the pessimists decreased in number. However, with the arrival of autumn, the trend took a 180 degree turn. My Comment: And this is happening before the real crisis has even begun. The layoffs are only starting, and people still have savings and the inertia of the past. The real crisis will begin in January-February of 2009. On the whole, people do not understand that they are already living in a different world – one that’s global, and whose laws they don’t know. These are the laws of the spiritual world that we aren’t following, which is why we are experiencing our discrepancy with them as a crisis. None of the previous methods to outlive or out wait (while stocking up on salt, matches and soap) will help us. But perhaps we will suddenly wise up, and just by desiring to learn about the law of globalization (“Love thy neighbor as thyself”), we will cast all the evil away from us and draw closer to goodness. News Report (from supportproject.eu): A recent study in six EU-countries found that problems such as depression, anxiety, phobias or alcohol dependence affected 11.5 % of their population. More people in the EU (almost 60,000 per year) die from suicide than traffic accidents. Before we appeared in this world, we were united together and filled with the Upper Light. Then, our unification was disrupted (broken), and each us was left inside his individual desire and perception, wherein we perceive only a small luminescence called “our world.” When we reconnect with each another, we once again begin to perceive the common Light – the Upper World. Question: What is the meaning of the expression, “There are many thoughts in a person’s heart, but the Creator will save us from all of them”? My Answer: Only the Upper Light can fill all our desires and thoughts by giving them the correct properties and forms. Question: Does the point in the heart depend on the number of life cycles one has gone through? I just don’t understand why it is still dormant in many people. My Answer: The point in the heart awakens when a person grows disillusioned in trying to fulfill all his earthy desires. It is for this purpose that he goes through a history of lives for many millennia! Question: I have been studying Kabbalah for the past two years or so. There are two things that seem to confuse me and that could be because I keep on associating the meaning of “pleasure” and “desire” with our world. It would be greatly appreciated if you could expand on these two words for me or direct me to the place I can find the information. My Answer: Pleasure is the sensation of a fulfilled desire – any desire. Desire is an aspiration to fulfill oneself with something one desires, with pleasure. However, in Kabbalah the desire is a desire for the Light, and the pleasure is pleasure from the Light. Question: Is it possible to convey the essence of your lessons through sign language? My Answer: Yes, if someone will understand it, for example, deaf people. Question: In my search for spirituality I found many methods of spiritual development, including different forms of Kabbalah, yet I still haven’t found a remedy for my soul. Does it even exist? My Answer: Only you can find your own path, without any influence from others, without “help” from outside, and without looking at what others are doing. And the same goes for every person. Question: Say a Hindu sage reduces his ego to zero point. Would he not then sense the spiritual world? Does he attain the screen? Or does one experience the illusion of evolution from the very beginning all over again? My Answer: A screen can only appear over a desire that is above our world, but all the religions and other methods actually decrease the egoism of our world. So how can a screen appear over the leftovers of a suppressed egoism? Question: Does Kabbalah talk about the non-dualistic? Meaning, that there is no person, ego, world, etc. Just consciousness. What prevents us from seeing that consciousness is the concept of “I” which takes credit for everything that happens in the world when in reality the “I” has no real choice whatsoever. Choice and events just happen. My Answer: In Kabbalah, everything is researched and verified experimentally. The only proof for something is one’s perception of it, rather than any kind of fabrication. Kabbalah does not negate or assert anything; it is a practical expansion of our perception. Everything that was created, and everything taking place, is necessary for us to understand the Creator. If a person does not forget this, then he focuses on understanding how the Creator communicates with him through everything that’s happening inside him and outside him. This is similar to how an infant learns to communicate with his mother. Have you ever noticed how intensely he looks at her, trying to understand what she is saying to him, trying to learn her language? It is precisely through the current crisis that we are given an opportunity to detect what the Creator is clearly trying to tell all of us. In the past, He only communicated this way with select individuals. But today, all of humanity must start paying attention to the Creator’s actions. This is what we lack. If the world would understand this, we would avoid all the unpleasant events taking place today, as well as those still in store for us. That’s because instead of fighting wind mills, we would communicate with the cause of it all – the Creator. The faster we begin to discern the Creator’s communication with us through the things taking place, the sooner we will understand Him. We will then discover what it is we need to correct and change – and the world will be filled with Light. My Comment: We can receive from our world only as much as an animal can: only what is necessary for our body’s existence. In this regard, we are completely the same as animals. All the excess that we “receive” is only to our detriment. There’s a wise saying, “A bit of harmful food is healthier than too much healthy food.” Excess creates emptiness in us, bringing about depression and an endless pursuit of illusory fulfillment. Question: I study over the Internet, and I am a secular person, but I am not clear on what to do about the commandments (such as Kashrut, Tefillin, Tzitzit, Kippah, prayers, and so on). Even after listening to your lessons on religion, I’m still not clear on this: is the path of personal correction enough or do I have to start observing the commandments in addition? My Answer: Kabbalah encourages every person to remain the way he is. Only the Upper Light can correct a person; therefore one does not have to do anything else other than study (which includes the group, Maaser, books, dissemination, and for a man, it’s preferable to be married). All the corrections inside you will be done by the Upper Light (Ohr Makif). Question: Should one observe the commandments or only study? And how do people get to the point of completely nullifying their egoism and attaining love? My Answer: Live just like you did before, and study Kabbalah. The Light will guide you as to how you should change. Question: Should a married woman who studies Kabbalah observe the corporeal commandments? If yes, then which commandments should she observe? And what is the spiritual root of a family’s ritual purity? My Answer: The purpose of all the corporeal commandments is to preserve the boundaries of one’s existence, but not to correct one’s soul. We at Bnei Baruch observe them as a cultural heritage or tradition. Kabbalah does not obligate anyone to perform any physical actions. Question: Aren’t the commandments that were commanded to us advice that we received on how to build the proper vessels suitable for our spiritual root? Then, once we acquire experience in building the proper intention, we will come closer to creating a vessel for the Light that will fill it? My Answer: Certainly, you are correct. All 613 commandments are the correction of the 613 desires of the soul by means of 613 Lights that shine and correct them during the study of Kabbalah. Question: If one is living in such a circumstance of being in a community where the outward observance of Mitzvot and Halakah are a norm, then isn’t one required to live in accordance to this social decor? One may remain inwardly “secular,” or constantly questioning the validity of their own intentions and desiring to know (not believe in) Ribono Shel Olam (the Creator), correct? May we be inwardly connected to the World Kli, studying with Ari Online, being part of the group, and yet outwardly walk in clothing of Orthodoxy? My Answer: Of course, and this is what the Torah demands of you: while following the external rituals, to add their inner, true observance. Or in other words: to add the true Torah to the simple Torah. Kabbalah is referred to as Torat Emet – the true Torah, and also as Pnimiut HaTorah – the inner Torah.